This weekend I harvested 3 cantaloupes from our garden. Two of them were squishy so I was anxious to crack this one open as it was super pungent. It isn’t the sweetest cantaloupe I have ever had, so I should have waited a few days to open it up. This picture was shot with my 50mm f/1.8 at ISO 100, F/4, 1/8 sec. One of my personal goals of gardening each year is to produce fruits and vegetables for my smoothies (carrots, apples, bananas, spinach/kale, blueberries & strawberries). I haven’t had any luck getting them all to harvest at the same time, but maybe one day. 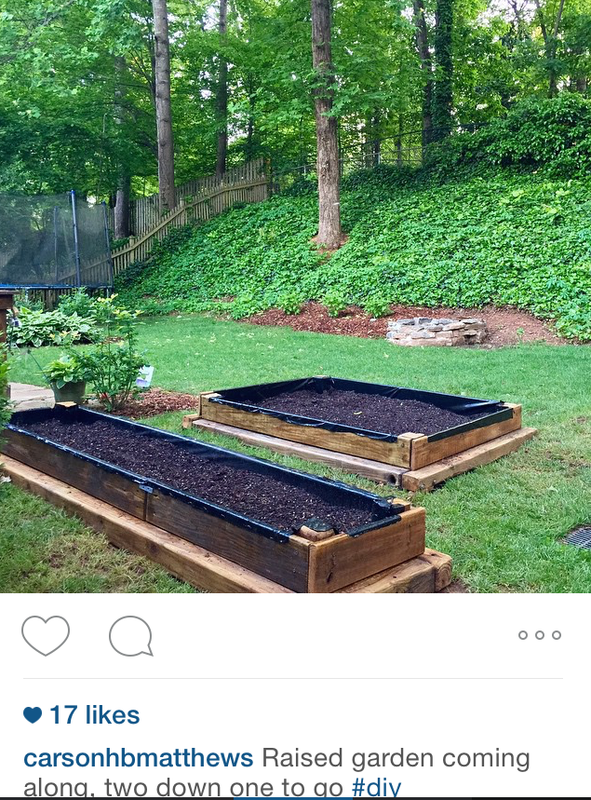 This fall our garden at the Barn at the Chastain Park Conservancy has featured smoothie ingredients carrots and kale. We had a big snow a couple of weeks ago and decided to get these beauties out of the ground. This bunch of carrots came out red, orange & yellow. The Matthews back yard garden is starting to produce fruit in the way of tomatoes, cucumbers and squash. Below are some pictures of the progress. We are still waiting on the zucchini and green beans to start fruiting. Not pictured below are the bell peppers which are starting to change from green to red, and now have a purple tone to them. 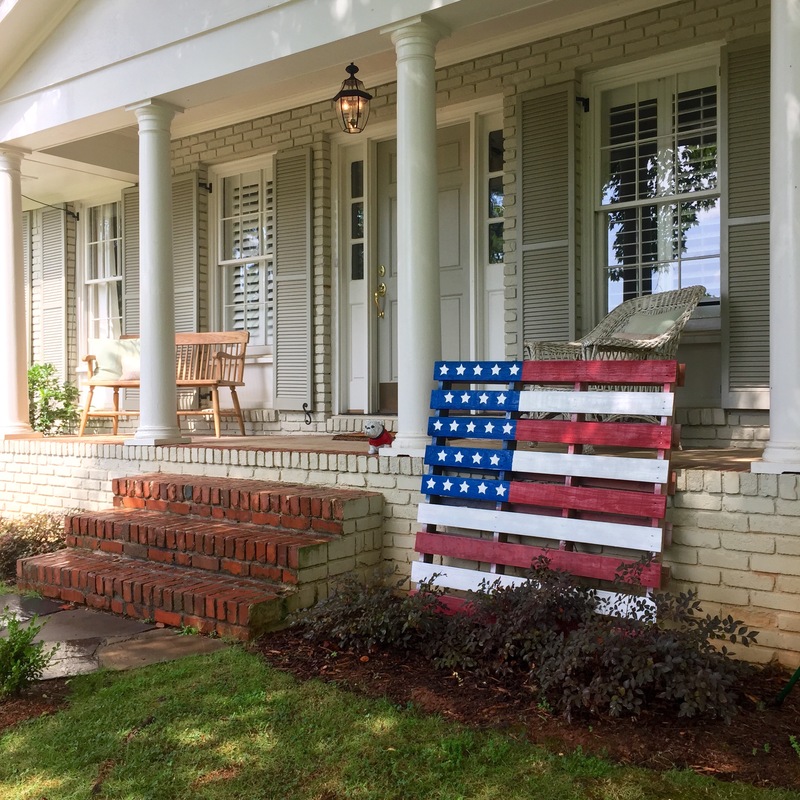 After a couple of months of driving by a wood pallet on the side of Northside Drive I finally picked it up earlier this spring and set out to make some yard art out of it. I had been on the hunt for a pallet that I could make an American flag out of. The first one that I got didn’t have enough slats on it, so I now use it to store my garden tools. The good folks at Ace Hardware recommended I use spray paint that has built in primer. So with red white and blue paint and some really thick masking tape I set out to create my flag. Here are some pictures of the progress, and the finished product below, just in time for the 4th of July. 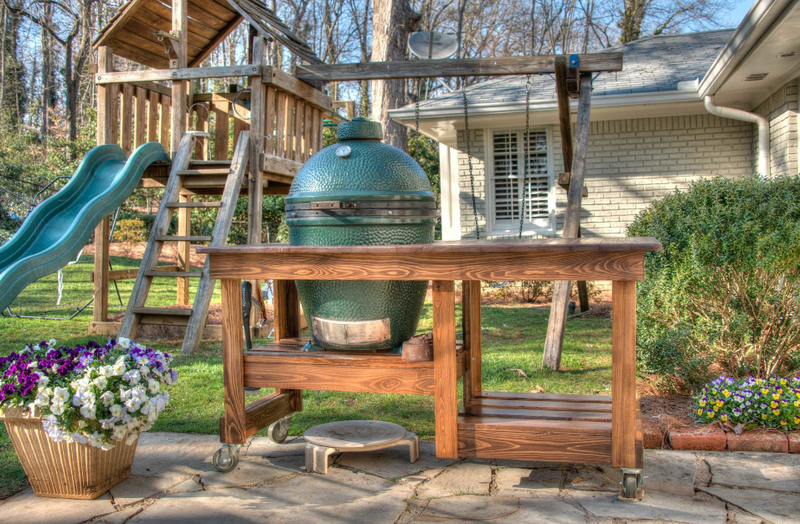 Many years ago my friend and Atlanta home builder Stuart Grubb and I went and disassembled a play set in someones yard and reassembled it in my yard. Over the winter I convinced the boys that it was time to say goodbye to the play set and recover some of the back yard. 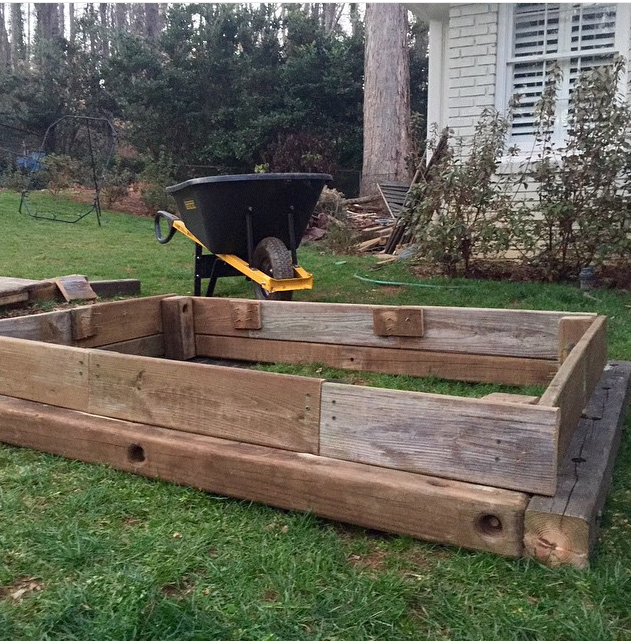 In doing so I set out to build raised garden beds from the lumber. You can see the play set in the background of this picture. It took a couple of tries to find the right combination, but I was able to come up with a prototype. Here is a picture of the first attempt… it wasn’t perfect so I broke it down and started over. Not knowing exactly what kind of wood it was I did a lot of research and came up with a plan to make sure nothing was leaking into our food as it was growing. I sanded all of the surfaces, sealed it with MINWAX Helmsman Spar Urethane, and wrapped the interior surfaces of the wood with black landscaping plastic. 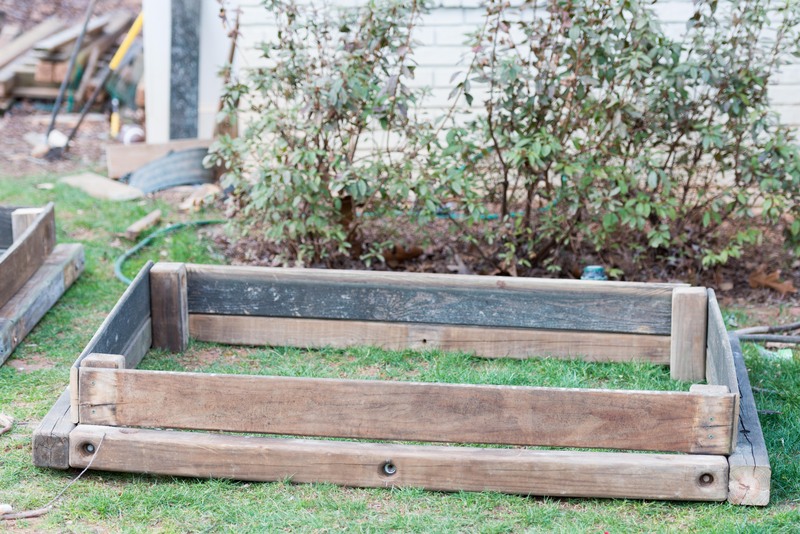 Here is what they looked like once complete and filled with garden soil. Once I had them all completed I planned out each garden with an online garden planner. Between Pike Nursery and Lowes I was able to get all of the fruits and vegetables I needed to complete my gardens. 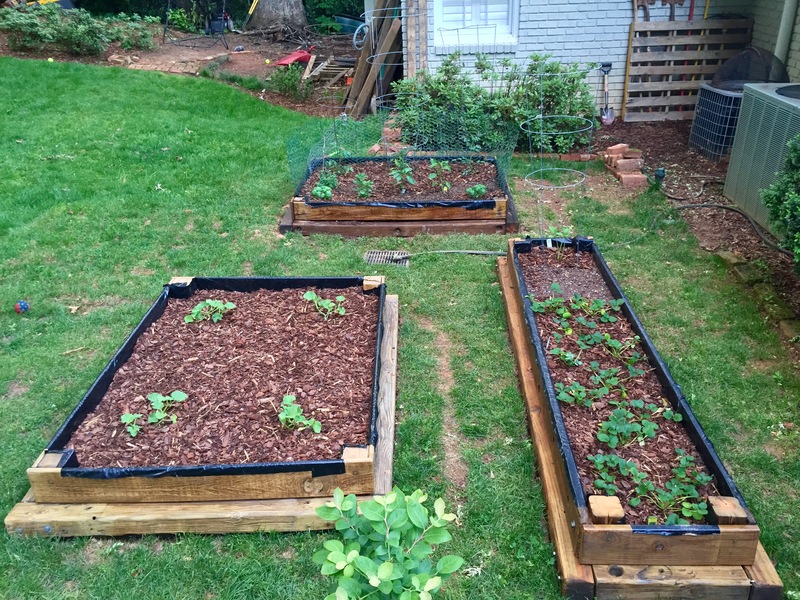 Below are some pictures of the blooming fruits including tomatoes, blueberries, strawberries, and cantaloupe. 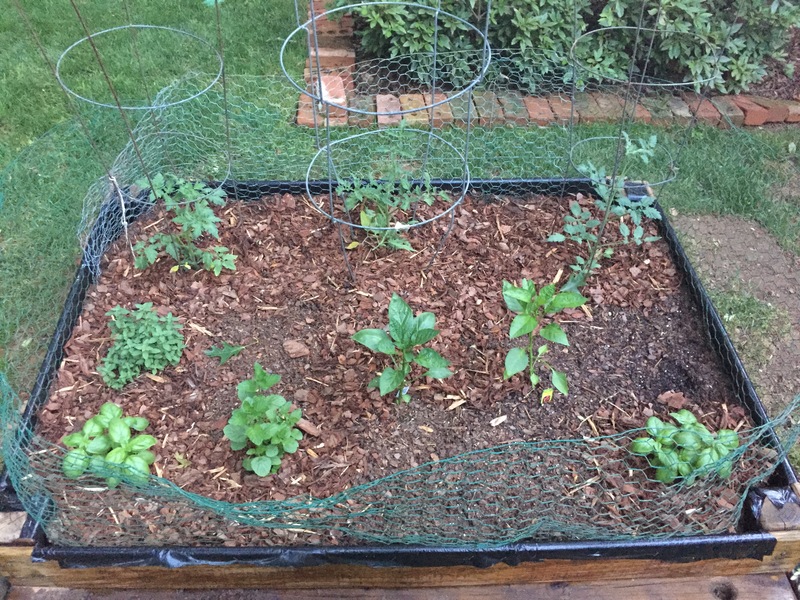 Now that the fruits are blooming I have installed a netting layer over the gardens to keep critters and other animals out. This will be a fun year of gardening with hopes of supplying most of the ingredients for my daily smoothie. Keep posted as the garden continues to grow!